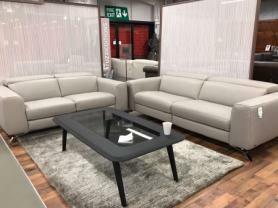 Lovely full leather compact corner sofa with high backs and pocket sprung seats. Exremely comfortable as pocket sprung seats are renowned for their comfort. High backs for that extra support. The corner comes with a matching power recliner chair which has a USB charging port to power your gadgets. Quality sofa built with durability and comfort in mind. Approximate Measurements: 203 cm x 230 cm D: 94 cm. Chair: 109 cm.